In our homage to the 'golden age of film' this upbeat cabaret piece celebrates Hollywood's musical films in a camp and comic way. Featuring dancing/hula hoop girls, a giant banana chorus, a surprise reveal of Carmen Miranda and an audience conga line. Set to Harry Belafonte's 'Jump in the Line' and interspersed with some audio clips from Carmen Miranda's better known films, this routine has a strong Latin theme. 'Mad Lizzie' Webb smashed onto our to screens with her crazy hair and pyjamas, the 'Green Goddess' Diana Moran gave us a good morning workout, Mr Motivator made it his mission to get Britain moving, and Jane Fonda, well, WOW! Now it's the Sparklettes turn to try and motivate you and inspire you to get into your leotards and bust that fat and burn up those calories as we launch our version of the 80s TV aerobics routine! Can you keep up? WARNING - This is a fully interactive routine! This 70s disco classic blasts us into space with a routine set in homage to Hot Gossip and their track 'I lost my heart to a starship trooper). This complex routine features multi-level tricks and sections simultaneously smashed together in an epic space disco fantasy sci-fi performance. This routine captures the very essence of what Sparkles Hoop Troupe is about - top notch tricks, epic performance and fabulous costume! This fabulous routine is based on Pappa Hoops life long fantasy of having a tiger taming circus act! With a health mix of weird and a extra big splash of fabulous this Weirdly Fabulous routine is our first improvised routine! Watch as the Tigers hit the ring with their 'Paris is Burning' ballroom inspired vogue battle before being trained by the slightly polwer obsessed tamer! Will the tamer get the Tigers in line or will the Tigers win over?! You'll have to see this routine to find out! 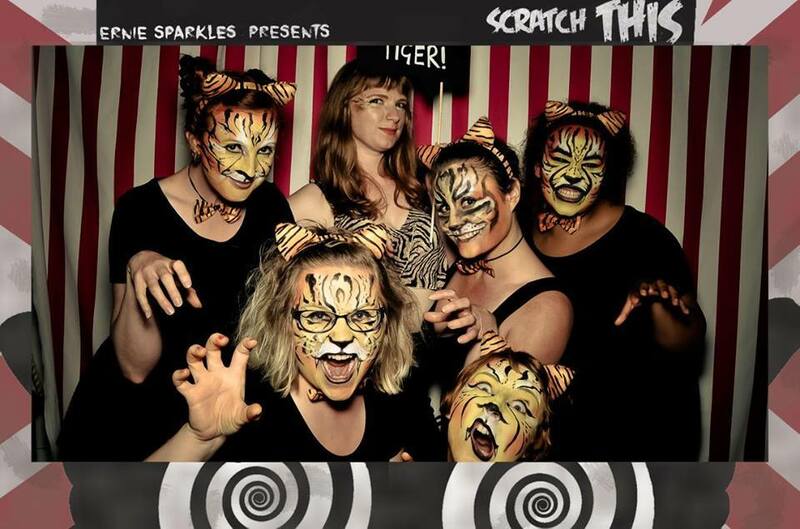 This super sweet and kitsch routine brings all the sugary goodness of a sweet shop as the Sparklette's bring your favourite treats to life! Set to a version of the Chordette's 'Lollipop' with fabulous dresses and sassy hotpants this cheeky little number is bound to satisfy your sweet tooth and leave you wanting more deliciousness! Originally created for Tenovus Cancer Care's Dahlicious ball, this routine saw its debut performance in March 2016. This electric swing version of the classic 'It Don't Mean A Thing' is our first ever performed routine. Set it the style of the glitter and sparkle of the 1920s this routine features the freedom and exuberance of the Charleston with a modern twist. The costumes are an eclectic mix of modern and retro and include an insane amount of sparkle - in a nod to our name - Sparkle's Hoop Troupe! This piece, specifically designed for 'Journeys' - NoFit State's celebration of 30 years of circus and the closing of the John Street venue is set to a piece of music in their back catalogue. 'The Gardener' by Fireproof Giant is a fun and lively routine designed to throw happiness and party feel to the show. 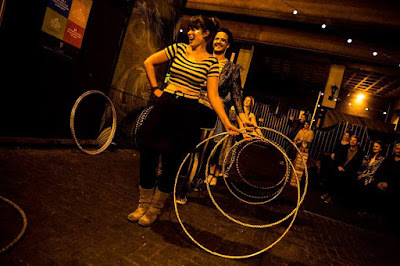 The routine has subtle nods to some of NoFit State's previous shows and has a vintage feel - set in the 1950s with housewives and factory workers celebrating the arrival of the weekend and hula hooping into an epic street party which culminates in a giant audience participation conga line!